Hey guys! When it comes to my hot beverage of choice I am much more a tea person than a coffee person (although I do enjoy both). I have no less than 25 different kinds of tea in my house at any given time, and I am always trying new ones and seeing what is out there. I recently stumbled across a DELICIOUS one that I had to pop on here and show you guys. 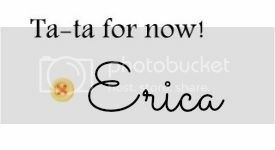 I don't even remember where I heard about it, but it sounded like something I would enjoy so I went ahead and ordered it. 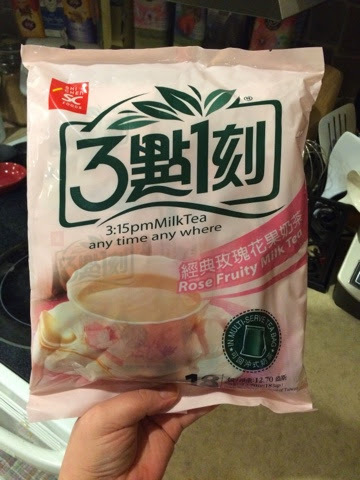 The tea I am talking about is the 3:15pm Rose Fruity Milk Tea. I found mine on eBay, and I got 18 bags for $16.99 with free shipping. I got this big bag that was sealed and the date was good (for 2 years). Inside of the big bag there are 18 individually wrapped tea bags. 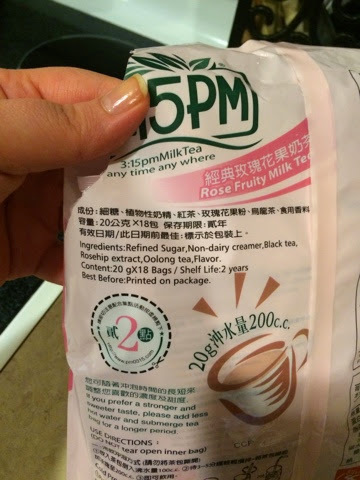 I had never even heard of Milk Tea, so I'll tell you what it is if you don't know as well. 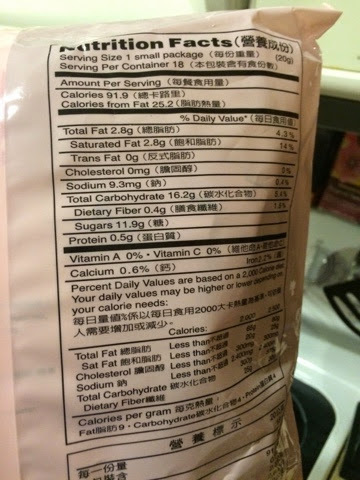 This packet contains both Black &Oolong teas along with refined sugar and a non-dairy creamer. So, every single thing you need for a cup of tea is right there in the packet. How handy is that? 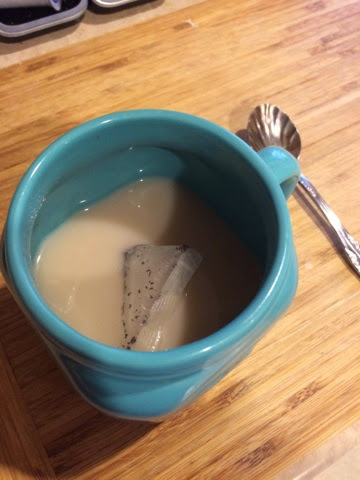 All you do is put the tea bag in a mug with 7oz of hot water, let it steep for 3-5 minutes, remove the bag and enjoy! 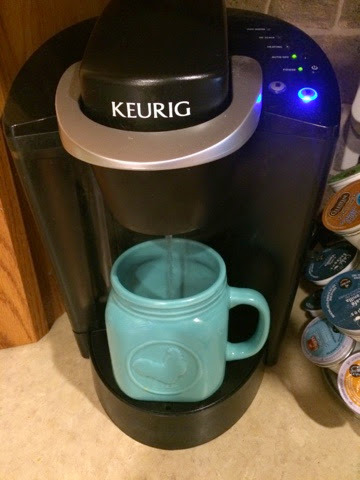 I make all of my teas with hot water from the Keurig. And this is what you end up with, a creamy/milky tea that is so good! I know it says 'Rose Fruity', but this tea doesn't taste like a rose. 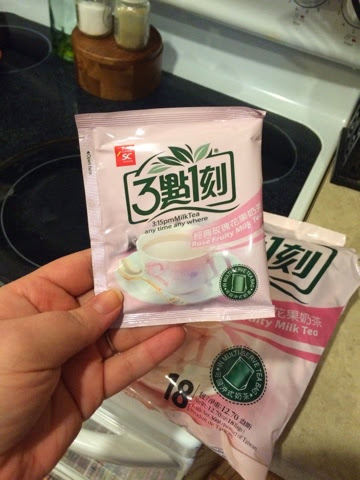 It tastes like tea, it's just not very strong, and it's milky and slightlyyyyyy fruity. I enjoy it SO much!!! 3:15pm makes several other flavors: Roasted Milk Tea, Original Milk Tea, Earl Grey Milk Tea, Coffee Milk Tea, etc. I thought the Roasted Milk Tea sounded good so I did place an order for that as well, but I haven't received it yet. I don't know how in this world it could beat the Rose Fruity one, tea just doesn't get much better than this. Alright guys, hope you enjoyed this. 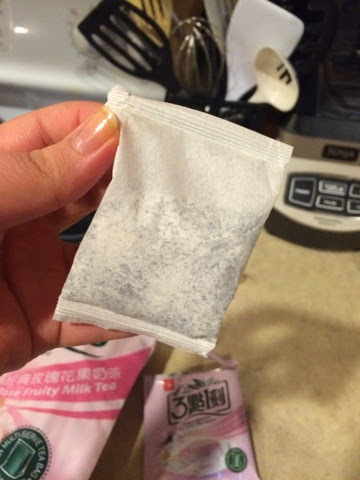 I think this tea would be great for on the go, you could just toss a couple of bags in your purse and use at a restaurant or what have you. What's nice is you don't have to worry about having any condiments as the milk and sugar are already in it. Let me know if you try it out! Who else is going to see Mocking Jay part 1 tomorrow???? YAY!